Using and Tuning Your Bandsaw is the seventh in Hendrik Varju's series of woodworking DVDs and, like his previous titles this is an exhaustive coverage of the subject. Over four DVDs and nearly eight hours Hendrik covers all of the essential topics relating to these machines. These include bandsaw selection - of both American and European types - blade selection, the types of steel used to make each blade, blade installation, care and tune up. For those nervous of tuning up and improving large pieces of woodworking machinery Hendrik's patient and measured advice is worth every penny. But this forms only part of the instruction given: there are seven further chapters on bandsaw use including general crosscutting and ripping techniques and re-sawing tasks. There are also chapters on free-hand curve cutting, including how to make tighter outside curves with a wider blade using relief cuts, circle cutting using a simple jig, how to cut a full tail board for dovetails and the cutting of a tenon to achieve an accurate fit in a mortise. Hendrik also teaches how to cut a complete half-lap joint on the band saw, showing a simple way to creep towards a tight final fit. The bandsaw is perhaps the most under used machine in many woodworkers' workshops. 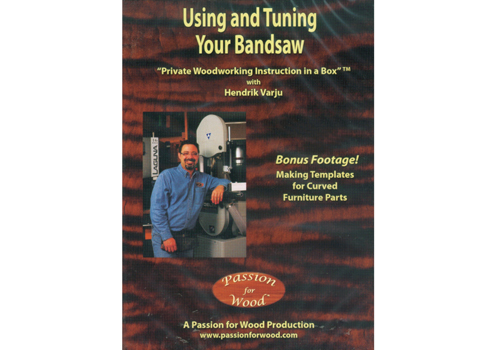 If you own a bandsaw and want get more from it or are planning on investing in one and want to know the details of use and tune-up then this DVD will cover all you need to know. Highly recommended.